If you want to give your interior space some substantial visual appeal, have you ever considered the fact that simply doing some simple but unusual wall painting is enough to transform your room into a ‘wow’ space? Now when compared to adding a new area rug, buying some colourful throw pillows to brighten up your sofa, installing a new set of blinds, or building a set of new floating shelves to place your objet d’art collections, wall painting can and will totally transform your interior’s feel and mood. For instance, with the right colour choice for three of your living room’s walls and a striking complimentary (or contrasting!) colour for the trims, cornices, and fourth wall that serves as the main wall (focal point), the results you’ll get will be more astonishing than any of those furnishings mentioned above. You’ll be surprised how a simple paint effect can transform a room’s interior, giving it a pleasantly welcoming ambience. If you are a DIY enthusiast and wish to transform your room’s interior yourself, you can give your space a simple but striking makeover with any of these two different paint application techniques. Sometimes, depending on the effect you aim to create, these two techniques can be used together for interior wall painting. This painting technique is the most commonly used and probably the simplest to do once you have the necessary tools. 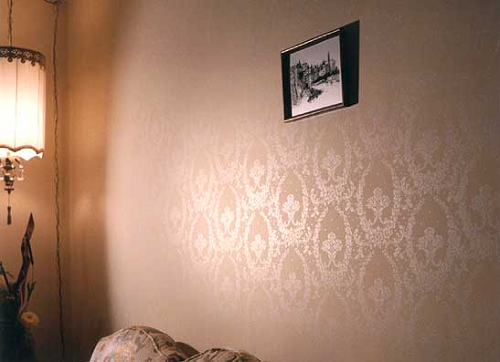 You can use it for plain block colours or decorative patterns that give the illusion of beautiful wallpaper or intricate wall stencilling at the cost of ordinary house paint. This works best when applied on a central eye-catching wall in the room. Paint brush for thin edges/areas and the hard-to-reach corners. There is a misconception that rolling can be more labour intensive than using a brush, but that’s really a matter of opinion. The great thing about using this paint application method is that it requires the least investment in tools, and best of all, you use less paint.
. . . And some determination! One thing to have in mind, before you attempt to spray painting, you must practice using the spray gun . . . try by practising on some plain cardboard; it’s not that hard to spray once you get the hang of it. Spray Painting or Roller Painting? So, if you were to choose between the two painting techniques, which would you prefer? However, with the right application techniques, it’s hard to beat the flawless finish of spray painting. It gives a perfect and uniform coverage for walls, including woodwork and cabinetry. And there are great time savings when you spray versus when you roll paint. Roller painting – If you are working on a tight budget, roller painting is best. It is very cost effective as there is no possibility of spills, drips, and over painting, as you’ll find when you spray paint. These all translate into wasted funds! But if you ask for my opinion, I’ll push for the roller painting application, especially if the house is currently occupied, and if a makeover involves just a few walls at best.